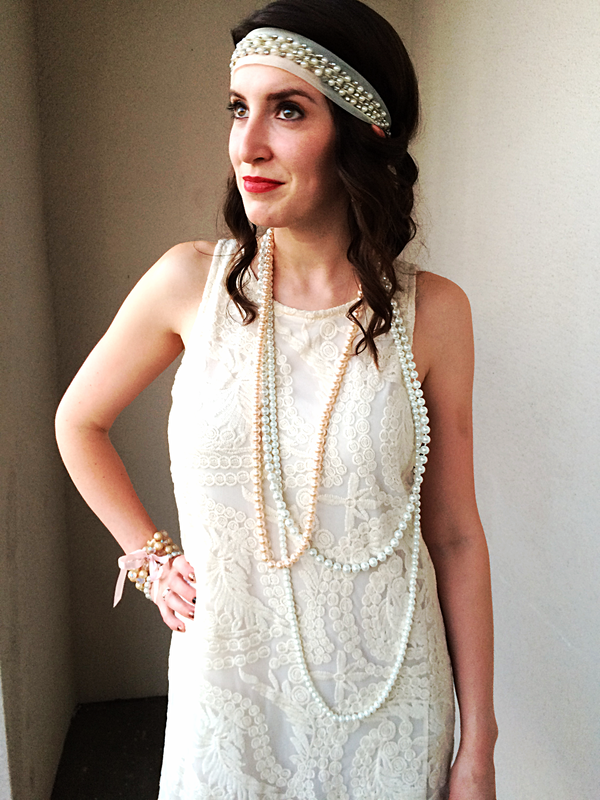 So you all saw the pictures from Megan’s Great Gatsby birthday party which was one serious shindig. 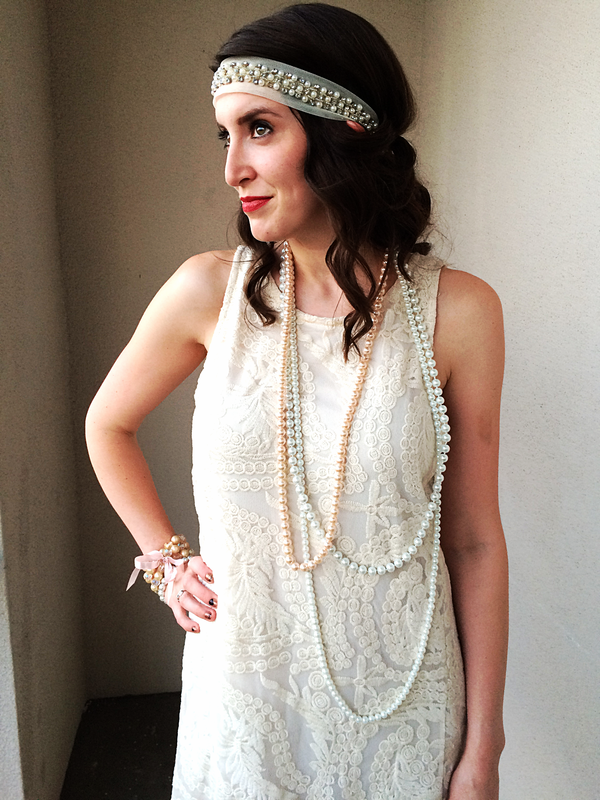 Megan had been planning to do a 20’s themed party for a while and picked up a fantastic flapper dress at H&M around Christmas time. Thinking it would be oh so simple to find a dress like she did, I waited until the day before the party to go shopping. I was not so lucky. Running through the mall like a mad woman I started thinking about making a flapper dress. It was going to be way too much work to make a whole costume in a day, especially a flapper dress that needs detail work like fringe, beading, lace, and sparkle. Since a fully handmade outfit was out of the question, I decided semi DIY could work. 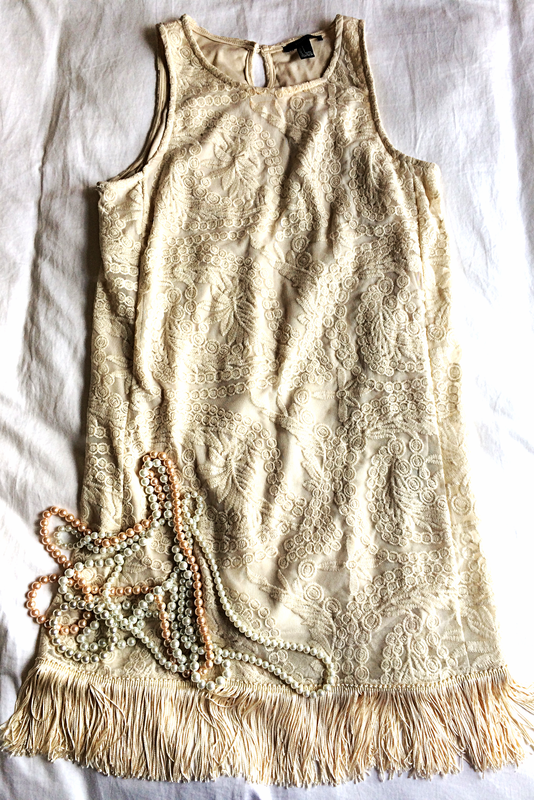 And so, I created this champagne colored lace flapper dress using a simple lace dress from Forever 21 and 1 yard of fringe trim from Jo-Ann Fabric for under $30! It’s a very simple project that even someone without a sewing machine could probably hand sew together in an hour – though sewing with a machine only took 10 minutes! The real trick to this look is finding the right dress. You want to make sure you buy a shift dress that is has a boxy silhouette. 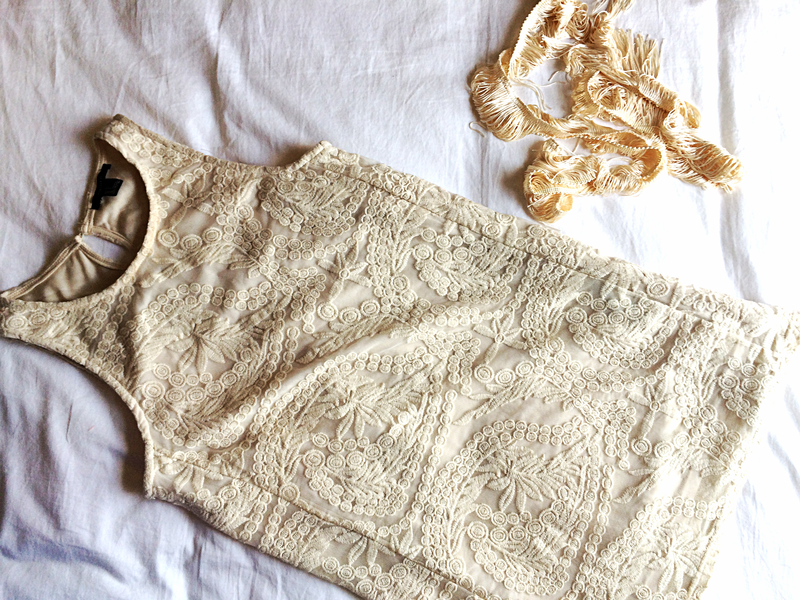 Buying a lace dress in a fit and flare style or one that is too tight will end up looking too modern. The dress should also probably stick to black or a muted color, mostly since fringe doesn’t come in every color and I doubt you want to dye it! 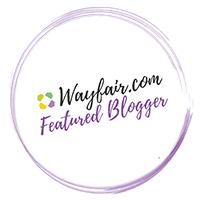 I listed a few options below if you aren’t keen on the one I purchased! 1. Take you dress and pin your fringe to the bottom hem of the dress on the outside of the fabric. 2. Use your sewing machine or needle and thread and sew a straight stitch along the top piece of the fringe. 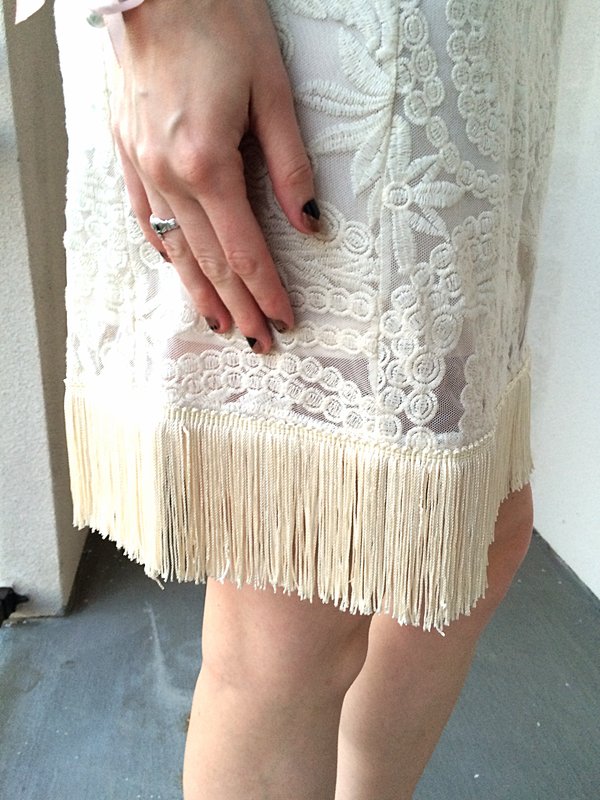 Remove the bottom hem of the fringe to allow the fringe to hang loose and separate. 3. 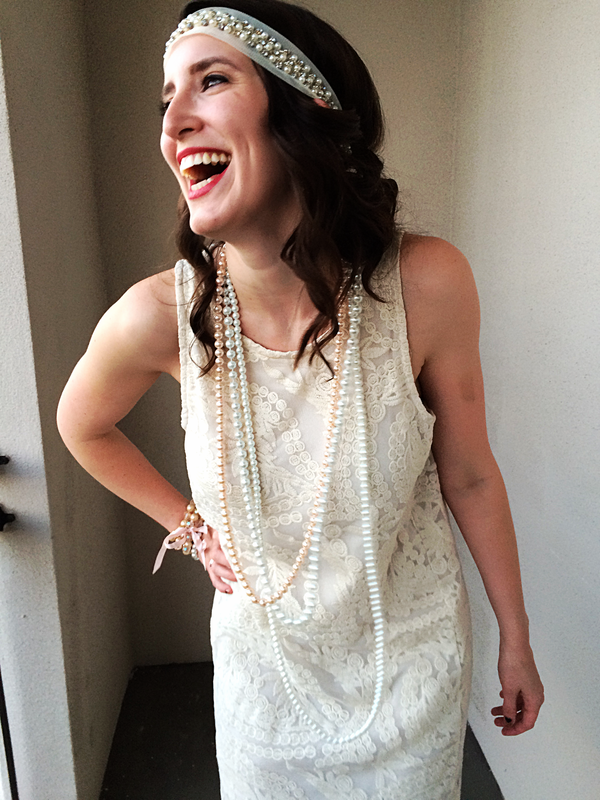 Style your dress with long strands of pearls, a sparkled headband, and some matching pumps! Wow!!!!!! I can’t believe you made it! That’s so beautiful! Thanks! Semi made, the best kind of craft! Thank you so much! It was a really fun dress to wear and make! Love this idea for a quick and simple dress update!